Kingston Heath, Emily Cornell and Cecillia Enjuto Rangel have been selected for the Graduate School’s 2014 Excellence Awards. The awards recognize faculty and staff who lead and manage graduate programs and enhance the overall quality of graduate education at the University of Oregon. Enjuto Rangel was awarded the Excellence Award for Outstanding Mentorship of Graduate Students. 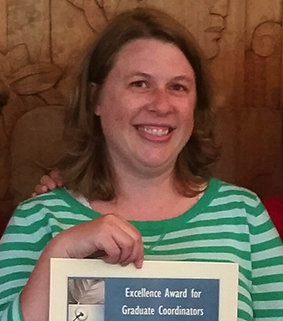 She was noted for providing unique mentorship opportunities to her students by actively bringing academic and artistic events to UO – events that keep her students up to date on scholarly advances and conversations, and provide opportunities to meet influential academics and artists in the field. Student nominators describe her as a challenging, but fair, teacher who fosters a love of culture and literature and expects only the best of her students. She works hard to put important scholarship, grant and internship opportunities within her students’ grasp. A common theme in Enjuto Rangel's nominations was her generosity with her time. "We want to emphasize that [Professor] Enjuto Rangel has markedly influenced our graduate study experience by giving a very precious and scarce gift among professors: time," her students wrote. The awards are based on nominations that demonstrate the nominee’s unique contributions, innovative ideas and program improvements that positively impact the graduate program or student experience. Nominations include letters of support, with at least one written by a student. The home departments of Heath and Enjuto Rangel each receive a $500 graduate student research/travel award in the recipient’s name. Cornell receives a $250 prize.